Love. In times of tragedy all we can do is Love. Receive it, show it, and most importantly give it. No one can possibly explain why the people of both Texas and Florida have been given the tremendous burden of facing the effects of Hurricane Harvey & Irma. What they will have to deal with for years to come is truly unimaginable. The Students of Augustana College want to do all that we can to give love and rebuild the lives of these victims. In the aftermath of the flooding, one of the biggest problems faced will be finding access to fresh, uncontaminated water. Please support the members of Phi Omega Phi, Phi Rho, and the entire Augustana Community as we walk for miles across our campus carrying buckets filled with water, symbolizing the journey that we will embark on to bring much needed clean water to the communities of Texas and Florida. All funds raised will be donated to the Lutheran Disaster Response. This non-profit organization will then use that money to directly purchase fresh water which can be distributed throughout both states. The event will take place 11:00am on Saturday, October 7th @ Augustana College. Our goal is to raise $10,000. 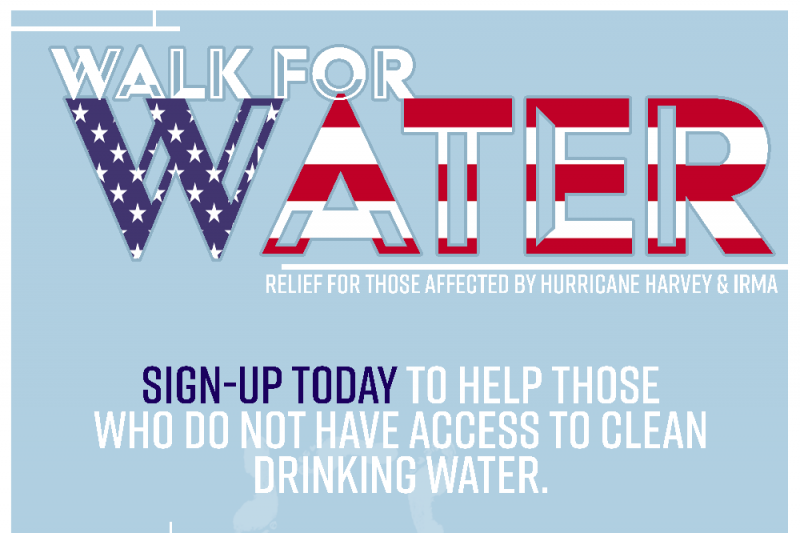 Any and all donations to support our Walk for Water will be appreciated beyond belief. Together we can truly make a difference, providing help and hope to those who need it the most.